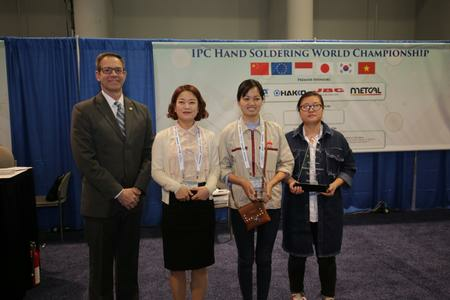 The fifth annual IPC Hand Soldering World Championship at IPC APEX EXPO® March 16-17 drew 10 competitors from around the world. Victors from IPC hand soldering competitions in Indonesia, China, Europe, Korea, Japan, Vietnam, and India were challenged with building a functional electronics assembly within a one-hour time limit. Completing the championship round with a score of 534 points out of 550, Vu Thi Xuan, UMC Electronics Vietnam Ltd., was crowned champion, earning her a $1,000 cash prize, a new America Hakko Products, Inc. soldering station and bragging rights as the world's best hand solderer. “Colleagues and show attendees who cheered on the competitors got a first-hand look at the best-of-the-best hand soldering talent across the globe,"said Kris Roberson, IPC manager of certification and training and competition coordinator. "We look forward to the upcoming hand soldering competitions taking place in Europe and Asia. "IPC thanks Premier Sponsors, Alpha Assembly Solutions, America Hakko Products, Inc., JBC Tools USA, Inc., Metcal, and Supporter Vision Engineering for their support of the IPC Hand Soldering World Championship,"added Roberson. For information on upcoming IPC Hand Soldering Competitions, visitwww.ipc.org/events.